The name LoveSpoon hails from the Welsh decoratively carved wooden spoons that were traditionally presented as a wedding gifts, ultimately symbolizing romantic intent. These spoons are usually intricately decorated with symbols of love, and they often reflect the skills of the carver. Today, because of their beauty, the spoons are now kept as decorative craft items as opposed to functioning utensils. In today’s society, the candle is often recognized as a symbol of romance, and LoveSpoon Candles has the perfect soy wax candles for your Valentine’s Day celebration! LoveSpoon Candles: Handmade Soy Wax Candles, Each One’s Unique! Since their inception, LoveSpoon Candles has been crafting handmade, 100% soy wax candles in a variety of colors and scents. Those of you who read this blog often know that soy wax candles are one of my favorite type candles simply because the soy wax burns much cleaner than paraffin wax. In addition to their using soy wax, each candle is also made with either a wood or a cotton eco-wick in order to make them even more clean-burning. 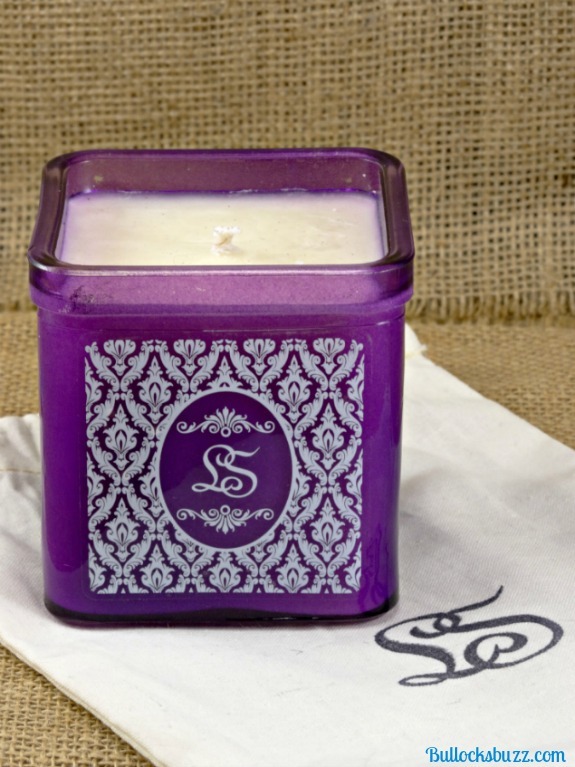 These beautiful soy candles are offered in two collection, the Cornerstone Collection and the Monogram Series, each of which are unique in their own way and available in several colors and patterns. Each candle in the Cornerstone Collection is a limited time edition candle that comes in a pretty decorative tin, and burns with a pleasant crackling sound reminiscent of a fireplace due to its wooden wick. The collection is divided into four categories: Serenity Sensations, Exotic Essentials, Decadent Desires and Festive Fragrances – each of which contain several different scents from which to choose. Rainwater, from the Serenity Sensations category, is the one I choose, and I couldn’t be happier! 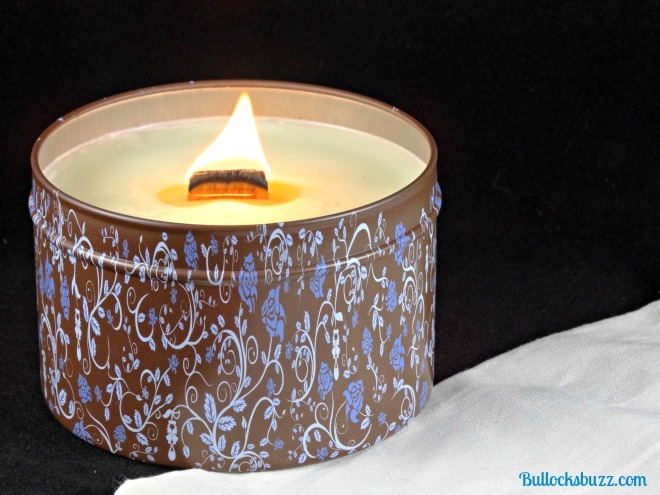 Measuring around 2.5″ high in height and 3.75″ in diameter, the tin has a pretty light blue and white floral pattern on a dark brown background. It is also pretty enough, and sturdy enough, that it can be used for all sorts of things once the candle is gone! The candle itself is a pretty pale green and has a wonderfully fresh and clean Spring-like fragrance. Once lit, the scent quickly fills the room, yet it is far from overpowering, and I love the crackling sound the wooden wick makes! Since it is a larger wick, the flame is bigger than what you would get with a typical wick, and it does flicker nicely. Be prepared for a bit of smoke when you blow it out, though. Regardless, it is still a much cleaner burning solution than many other wick materials. So far I have burned my candle for at least 8 hours, and there is still plenty of it left! LoveSpoon Candles’ Monogram Series candles come in lovely colored glass jars available in a rainbow of colors and scents. Each square-shaped jar has a delicate white print design on the very front, in the very middle of which is an oval and the company’s initials in a lovely script monogram. Like the Cornerstone Collection, the Monogram candles are also divided into the same four categories, each of which offer many different scents from which to choose. For this candle I choose to go with my all-time favorite scent, Lavender! First I want to mention that I love that the Monogram Collection candles arrive in a drawstring bag that you can re-use! 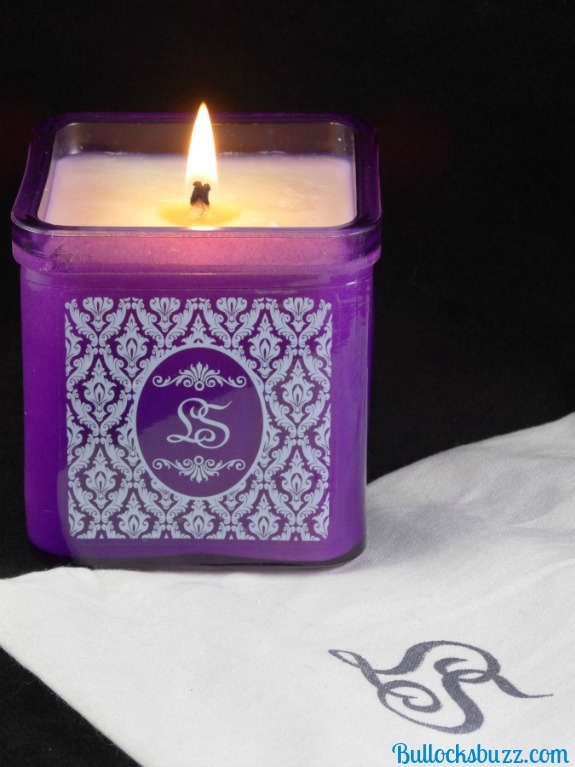 This white soy wax candle comes in a purple (my favorite color!) glass jar that measures around 3″ tall and 3″ across. Like the tins, once the candle is gone, I will be able to find all sorts of uses for the jar! This candle comes with a clean-burning, eco-friendly cotton wick that burns with a normal size, gently glowing flame that give the occasional flicker. Within minutes of being lit, the relaxing aroma of lavender fills the room, once again far from overpowering. This one I have used for about 5 hours so far, and over 3/4 of the wax still remains. Overall I really do like these candles. I love that they are eco-friendly and clean-burning, and how each one comes in a container that can be used over and over. They appear to burn pretty slowly which means you get a long burn time out, and the scents I have tried so far are pretty amazing! Price-wise, I do believe you get your money’s worth. Speaking of price, the Cornerstone Collection candles cost $25.95, while the glass jar Monogram Collection candles cost $19.95. One other thing I love about LoveSpoon Candles is that they make a point to give back to those in need and donates a generous amount to a chosen charity at the end of each year. Plus, if you have a fundraising event you would like them to participate in, you can simply contact them through the website and they will get back to you! 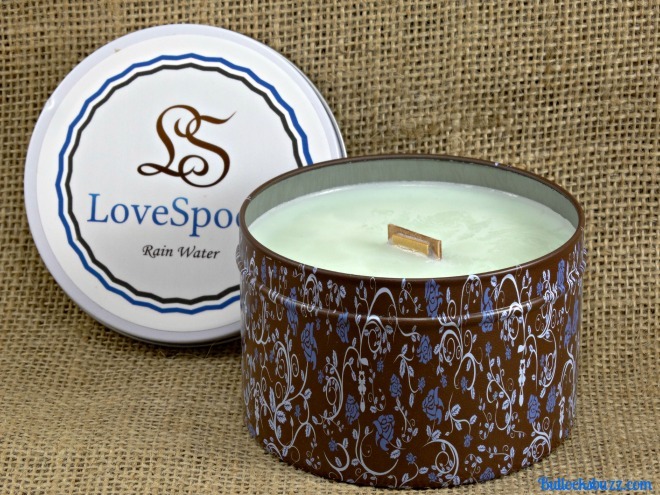 Whether looking for a special gift for Valentine’s Day or another celebration, or if you are looking for a pretty and fragrant candle for your home, I definitely recommend LoveSpoon Candles! 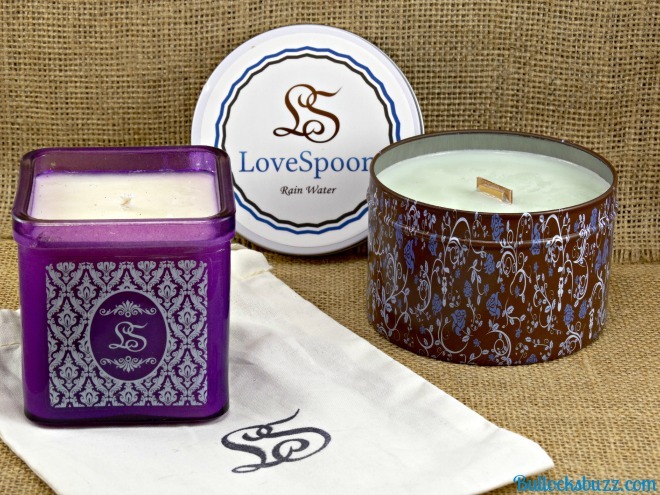 Which collection of LoveSpoon candle would you like to try? Do you have a favorite candle scent?